Lee Lindquist, ‘00 MD, ‘05 MPH, ‘10 MBA, ‘03 ‘05 GME, associate professor of Medicine in the Division of General Internal Medicine and Geriatrics, was always close to her grandparents. Growing up in suburban Chicagoland, Lindquist remembers packing into her parents’ car, shoulder-to-shoulder with her sisters, and making the 250-mile trek to her grandma and grandpa’s house in rural Wisconsin. And now, as a geriatrician who works with Chicago’s elderly, Lindquist credits her grandmother for her own success in medicine. And during that medical training, her grandmother did need help. After her grandfather passed away, Lindquist moved her grandmother into the two-bedroom apartment she shared with her sister in downtown Chicago. 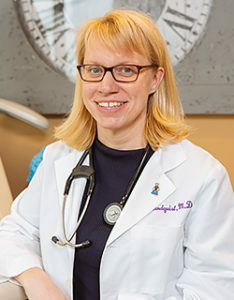 That experience with her grandmother, paired with her academic training — Lindquist has a medical degree, a master’s in public health and an MBA, all from Northwestern — affords her a unique ability to help elderly patients and their families. Lindquist’s research at Northwestern University Feinberg School of Medicine has spanned many aspects of elder care, from exposing the risks of hiring a caregiver to comparing the costs of care to life on a cruise ship. Keeping seniors safe and as healthy and independent as possible is a key theme running through Lindquist’s work at Feinberg, where she is chief of Geriatrics. By 2050, America’s 65-and-over population is projected to almost double, from 48 million to 88 million, and Lindquist says our current medical system is ill-prepared to handle that surge. A largely unregulated home care industry and a lack of trained geriatricians compound the problem, she says. Lindquist is a leader in a movement to help seniors “age in place” — that is, in their homes. While she acknowledges that this is not possible for all seniors, Lindquist believes physicians and care providers can do more to keep the elderly at home. To that end, Lindquist recently led the expansion of the Northwestern Medicine Home Care program, which brings primary care to patients’ homes in the Chicagoland area. Lindquist says the growing program has reduced hospitalizations and re-hospitalizations among patients. Planning is a core component of Lindquist’s work at Northwestern. As the over-65 population grows dramatically by the day, Lindquist is trying to help families nationwide prepare for the years ahead, so they can keep their loved ones at home, or so they’re not caught off guard if a grandparent suddenly can’t live alone. 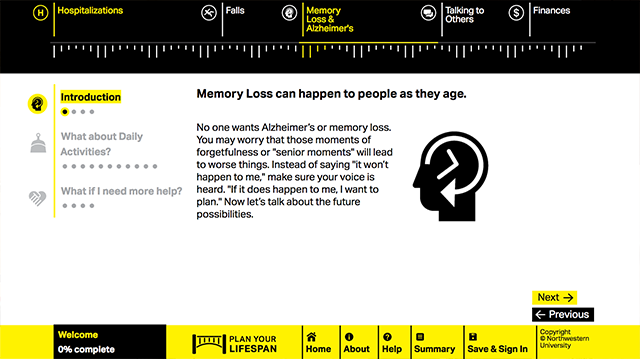 Lindquist designed PlanYourLifespan.org as a “choose-your-own-adventure” resource. The easy-to-use website helps seniors — and their family members — find high-quality home care services and other assistance like Meals on Wheels. Plan Your Lifespan is intended to be a one-stop shop to find all the services a senior might need — medical, financial, legal and otherwise. The offerings are tailored to each user’s zip code, which offers adult children peace of mind if mom lives in Ohio and they’re in California. “If you get hospitalized, do you want to go to physical therapy? Do you want to have a therapist come to your home? Do you want to do it in a skilled nursing facility? Here are the facilities you can choose from,” Lindquist says. The website’s extremely basic design is intentional: Seniors with low health literacy and few, if any, technological skills can easily move through the planning steps. And once they do, they can email their plan to loved ones. Chris Forcucci of Fort Wayne, Indiana, has been involved in Plan Your Lifespan for years, and she can attest to its impact. She is part of Plan Your Lifespan’s community-dissemination team: a nationwide group of people who serve as mentors for organizations, elder care homes and social service agencies that use the site with local seniors. After helping her own aging parents through medical issues and housing dilemmas, Forcucci now understands all too well the value of Plan Your Lifespan. In an initial trial, people using Plan Your Lifespan knew more about post-hospitalization services and long-term care services. Compared with a control group who did not use the site, Plan Your Lifespan users made more comprehensive plans — and communicated those plans more successfully. Plan Your Lifespan is now publicly available nationwide, with users spanning 48 states and growing. Lindquist has also seen interest from groups in Mexico, South Africa, Colombia and Canada, and physician groups nationwide may eventually share the website with all of their older patients. “We’re getting older adults who want to make their own choices, but then we’re also getting the family members that want to use it for their mom or dad,” Lindquist says.